This piece, which was made in the early 2010’s is a terrific example of Dorothy’s beautiful hand coiled shape and design work. See how well her black and white imagery fits on the jar. Narrow at the top, and wider on the base. It is so well conceived and so well executed. 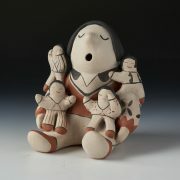 Dorothy Torivio was born on August 19, 1946 at the Acoma Pueblo. She died on April 20, 2011 at 64 years of age. She is recognized for her innovative work in seed-pot forms in both large and miniature sizes. She covered her vessels with black and white or polychrome patterns of remarkable intricacy, painted freehand using a traditional yucca brush. Her mother taught her to make pottery and helped her with her firings Her daughter helped her gather the clay, grind the mineral rock pigments, and chew the plant fronds for her mother’s brushes. 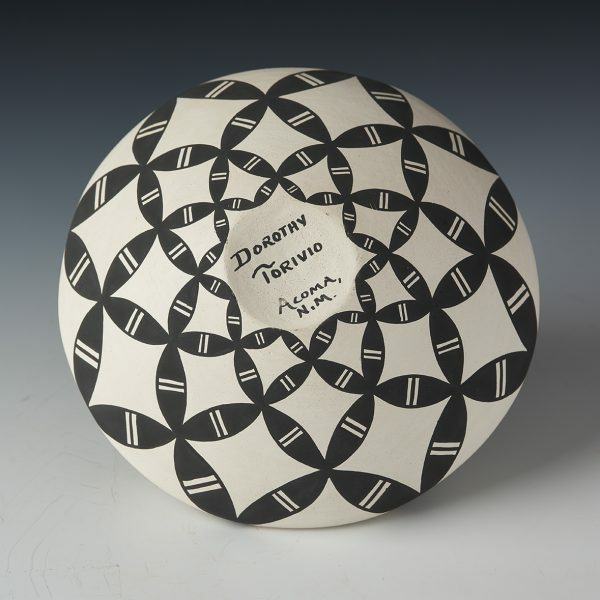 Dorothy specialized in Acoma hand coiled abstract pottery. 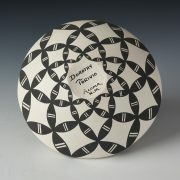 In 1982, Dorothy got the idea to paint a design and repeat the design on the shape of the pot. 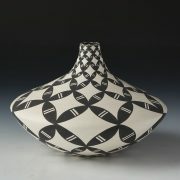 She basically combined the traditional pottery with her own desire for repetition and movement imagery. These designs have often been referred to as “op art” – true eye dazzlers. 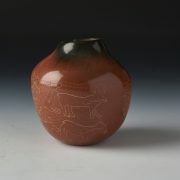 Particularly of note is the way she could fit her designs to the shape of the vessel – from wide to narrow areas of the pots. She was a true innovator.